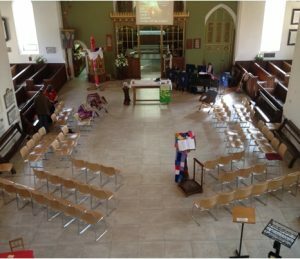 If you’re new to St Mary’s or to Burghfield and Burghfield Common, we’d like to welcome you to our community. We hope that this page will answer some of your questions about church life in Burghfield. If there’s anything else you’d like to ask, speak to the Reverend Glynn or one of the wardens: see our contacts page. We normally have two services on Sunday mornings: a 9:00am service of Holy Communion with hymns; and then a more contemporary worship for adults and children at 10:30am. We have refreshments from 10:00-10:30am, when there’s an opportunity to meet newcomers. This pattern has to change sometimes, so see our Service Times page for more information, or check the What’s on page for full diary information. Can I look round the church? Yes. St Mary’s is open during the day every day of the week. You’re most welcome to look around, or to just sit and find some peace. How can I find out about having my baby baptised? We’re happy to discuss baptism with you. You can find out more about the service on our Baptisms page, and then contact us at the address above. Can I get married in St Mary’s? Yes, if you live in our parish, or have ever lived here, or have a connection with St Mary’s Church. There are certain rules about who may marry in the parish church, but you can find out more on our Marriage and Weddings page or by contacting Reverend Glynn. I can’t find the answer to my question on this page! Please contact us and we’ll try our best to help you.